Oh, I have been waiting for the finale. Please trudge on! ...Rylan our only great grandson is claiming the little Construction quilt I did for the fundraiser! He thinks it's his! It very well may be, as I made more than I promised. ...Any little boy would love this quilt Carolyn. It is very nice, even if you're not too happy working on it and considering all the problems you've had. Please show us the finish, the grand finale! Understand your frustration, however know you will be able to get it done. Know there have been suggestion to pick out a block. 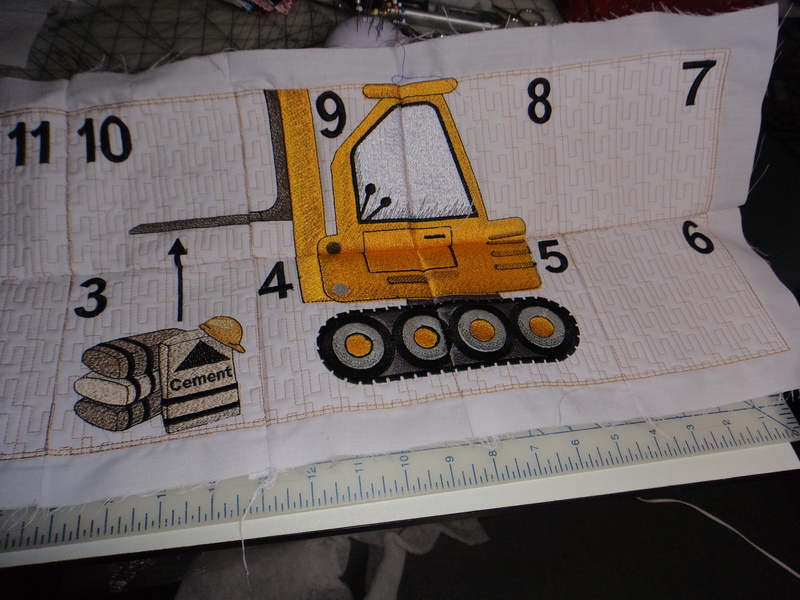 How about only picking out the dark line on the middle block and use zigzag stitch to place in correct place instead of doing the whole block over. Will not pray for patience for you just pray for strength. I agree with the others, it doesn't have to be perfect to make some little boy happy and I have faith that you have the talent to overcome some of these imperfections. Yes take a break, have a Kit Kat. Sure may help. I would help you finish it if I lived over there near you. Only place I see is that arrow--does it look like that on the site that sold the design? I will have to go see it if I can. Like one of the ladies said--maybe an inspiration will com to cover the spoilage [crooked arrow] like find a hard hat, construction one or is you have the software where you can trim some 'rocks' and hoop this block again to embroider extra rock to hide the arrow.. Something will come to you--you are an idea person. The designs sewn itself are pretty amazing and no puckers at all. Great looking-don't stop! I feel you should just continue on and do your best, any child would be thrilled with it!!! Awesome and lots of work put into it!! !Hold on!!Gorgeous!! I agree Carolyn. 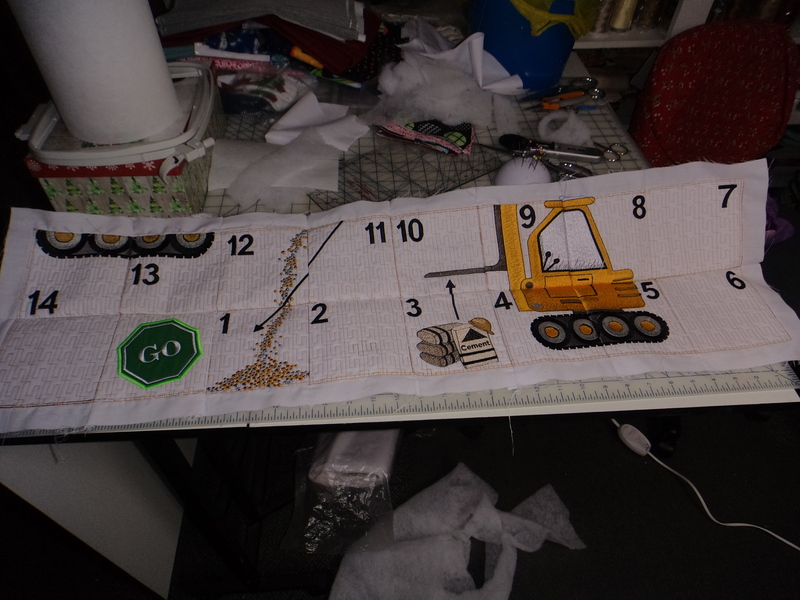 There are a lot of problems with this design, one of which is that the stitching is too dense where some of the blocks need to join. You know how many times I have restitched mine. But as I have told you we are our own worst critics. Hang in there. If there is anyone thinking of doing this quilt you might want to reconsider, but I am too far into it to give up now. That is marvelous. Look at the lines of the machine and the falling rock. 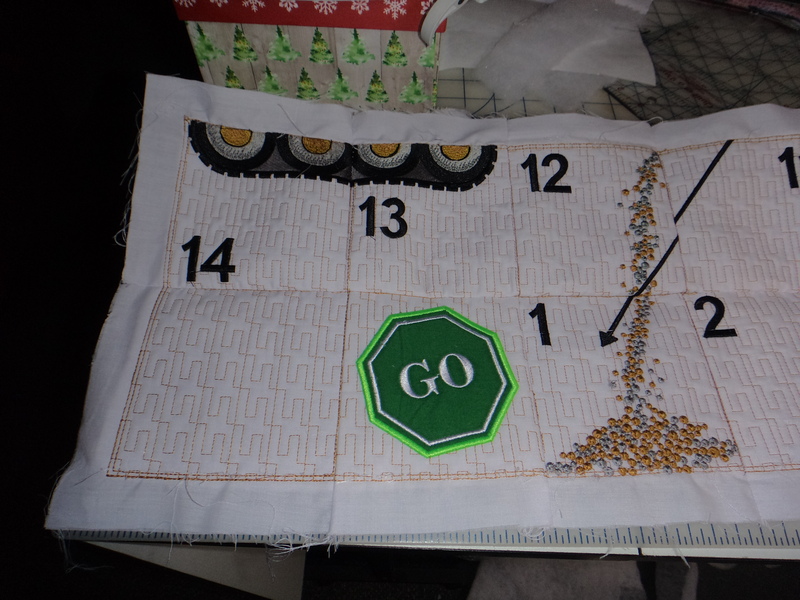 The arrow may need adjustment or some addition when the quilt is done. "anyone loose a hat to cover the jog?" If it will not line up, look at the finished design for inspiration for a 'hider' piece. A button that looks like a hat. Something will occur to you. THIS is a very hard piece and your too good to let a little tweak stop you. Don't give up on it.....I think it is fabulous...looking forward to the rest! You are doing a wonderful job.......Keep working on it! Trug on! I can see your outer edges are even, so I don't know how you could bring it up at #12 for the arrow line to align. It would be disappointing after all your work. 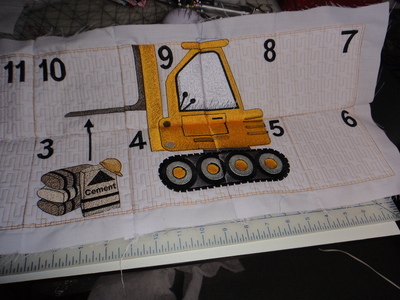 Maybe rip or un-pick just that block and re-sew (I know no one likes to do that but sometimes it's necessary) being careful when you sew the blocks together, to align the arrow line. I know it really will be nice when completed and you'll enjoy it then too. You go girl! Keep going my friend! There is really only one block that is really out of alignment...the more blocks you get done, the less it will be noticed...perhaps you can unpick that block and "fudge" it into alignment a bit better...don't get discouraged...the more you do, the better you will get. Keep on with it! Only way you're going to conquer it and you will end up with an other project well done! Plastic box and put all your fabric in there while you are constructing your quilt take out what you will be working with for the day. Happy stitching.